There is nothing quite like a water park on a hot, sunny day. You are able to enjoy the sun, the cooling waters, and the thrills of all the slides. In this list of the best water parks, we detail 25 water parks from across the globe that are a cut above the rest. These parks are going to offer every type of water slide and wave pool you can think of. Many of the parks on this list are also located in popular, scenic locations, making it easy to couple sightseeing with water park fun in one trip. 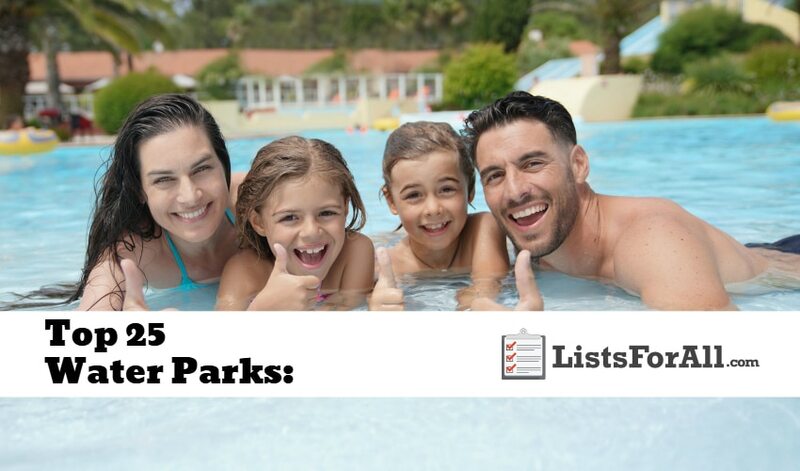 So, if you are a true water park fanatic, check out this list and start marking off your bucket list items! And, for even more fun, check out our list of the best roller coasters or our list of the best amusement parks. About Waterpark: A TripAdvisor favorite, this Thai themed water park is in the beautiful Canary Islands. The park features a nine-foot-high wave pool, as well as the “Tower of Power” which is a slide that goes through tanks of sharks and stingrays. 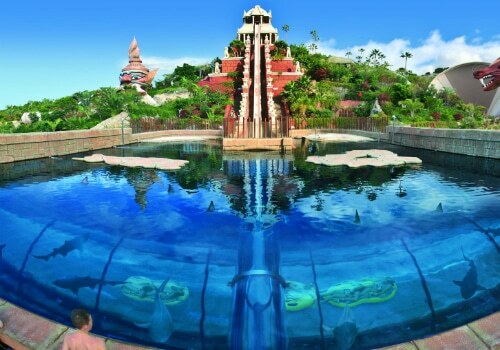 With a variety of other slides and family-friendly activities as well, Siam Park is perfect for all ages. 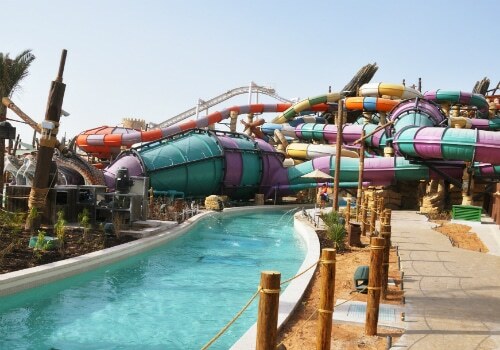 About Waterpark: Part of the famed Jumeirah Beach Hotel, Wild Wadi is a wild and wonderful water park in the middle of the desert. In the park, there are eight water coasters, heated and cooled wave pools, and one of the fastest and tallest water slides in the world. For true Dubai opulence, this water park is a must. 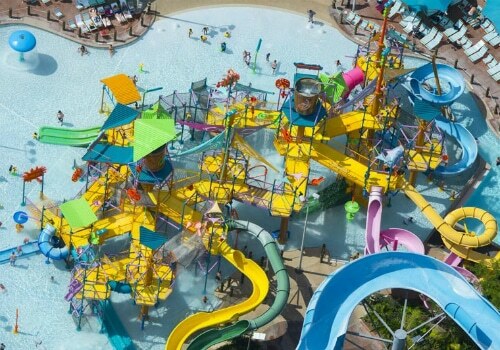 About Waterpark: With the water heated to a comfortable 82 degrees Fahrenheit, Aquatica can be visited year round. Also, Aquatica is a part marine park and part water park. This will allow visitors to interact with marine life, while also enjoying the many water attractions. And for those who want to relax, the park offers a number of beaches and private cabanas as well. About Waterpark: The largest water park in Latin America, Beach Park is 42 acres of fun. At 135 feet and 65 mph, Beach Park also boasts one of the tallest and fastest water slides, making this one water park thrill-seekers need to visit. The Kalafrio halfpipe tube slide is also a visitor favorite and will leave thrill seekers wanting more. 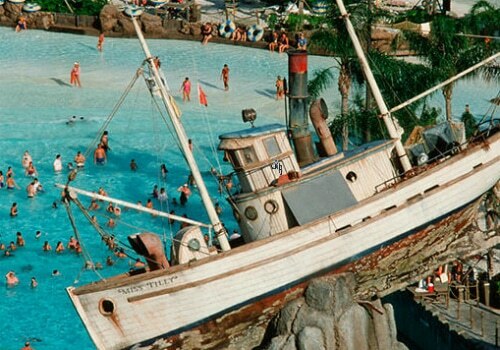 About Waterpark: With more than 2 million annual visitors, Disney’s Typhoon Lagoon is one of the most visited water parks in the world. Boasting true Disney flair, the park abounds with rushing rapids, lazy rivers, and relaxing sandy beaches. Visitors can also snorkel with sharks, stingrays, and an abundance of tropical fish in the Lagoon’s coral reef. 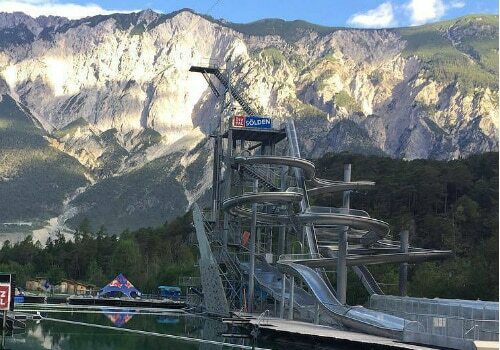 About Waterpark: With a stunning mountain backdrop, Area 47 is not your typical waterpark experience. The waterpark is going to use a lake for its water activities rather than human-made pools. With giant slides, a blob, wakeboarding, and so much more, they fully take advantage of the lake as well. Outside of the water, there is beach soccer and volleyball, as well as dining and drinks. Area 47 is an outdoor lovers dream, but inside the water and out. 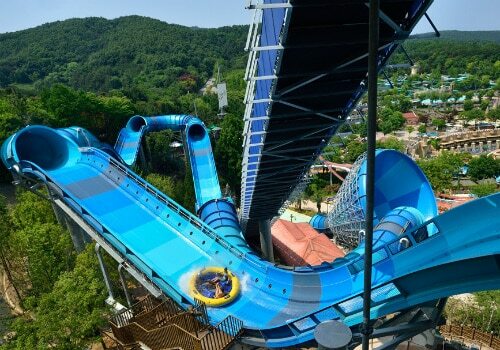 About Waterpark: Located in South Korea, Caribbean Bay is going to offer something for every water park goer. From giant water slides like Megastorm to relaxation in the Spa, there is plenty for both adventure lovers and those who enjoy relaxing. The park is also going to be very kid friendly as well, with all of the activities that are offered for smaller children as well. 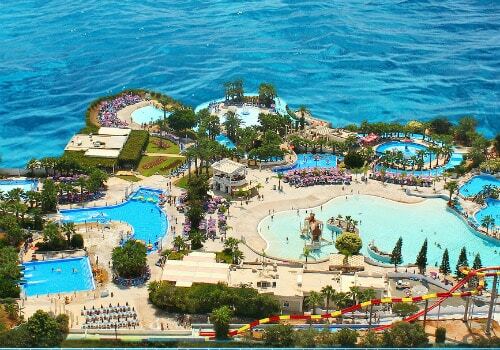 About Waterpark: Surrounded by the Mediterranean Sea, Cyprus is already a water lover’s dream destination. Now add in a variety of different water slides, wave pools, and more, and WaterWorld is a one of a kind water park experience. With so many different water slides, you will want to make sure that you have a game plan to get them all in during your visit. About Waterpark: Hot Park gets its name from the waters of the park that are naturally heated from 18 springs that encounter volcanic activity, don’t worry; it is entirely safe. These naturally heated waters are a warm and relaxing 99.5°F year round. 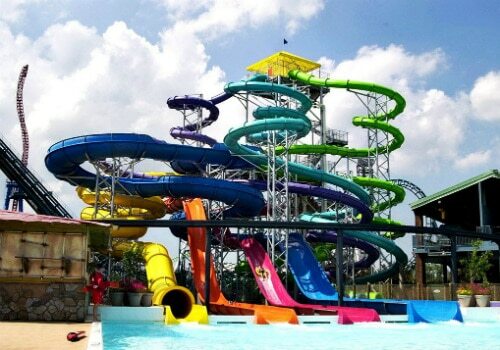 Along with the naturally heated waters, there are slides and rides to enjoy as well. Rides like Giant Slide, Aqua Race, and Half Pipe will all provide fun for thrill seekers. While children’s water playgrounds and more laid back pools will cater to everyone else. 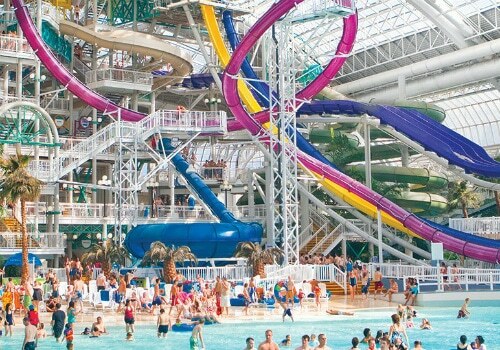 About Waterpark: You might not think of Canada as having one of the best waterparks in the world, but this indoor waterpark is absolutely amazing. This five-acre indoor water playland has slides, hot tubs, and children’s areas. And, best of all, the indoor tropical temperatures are welcoming year round for guests. Some of the other highlights outside of the water slides are the wave pools, surf area, and cabanas. 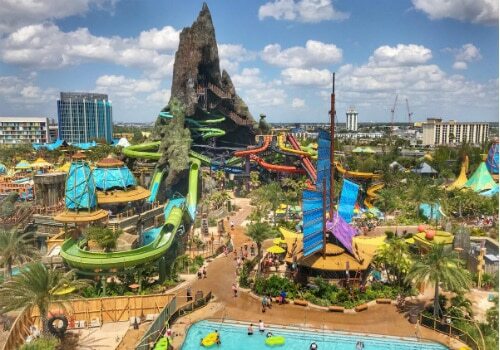 About Waterpark: Located in the heart of Disney’s theme parks, Universal’s Volcano Bay still shines brightly in its own right. With a giant volcano that stands out for miles, and waterslides ranging from relaxing to thrill seeker, Volcano Bay is a must. Also, for those who hate standing in lines, all of the lines at Volcan Bay are virtual. This means that all you have to do is sign in with your wearable wrist band and then show up when it is your time to ride. In the meantime, you will be able to float, swim, relax, and do whatever else the park offers. 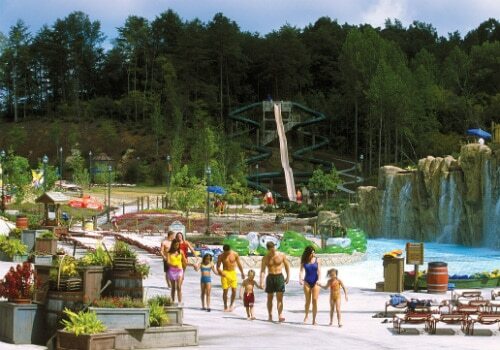 About Waterpark: Located next to the Dollywood theme park, Dollywood’s Splash Country offers wet and thrilling fun. 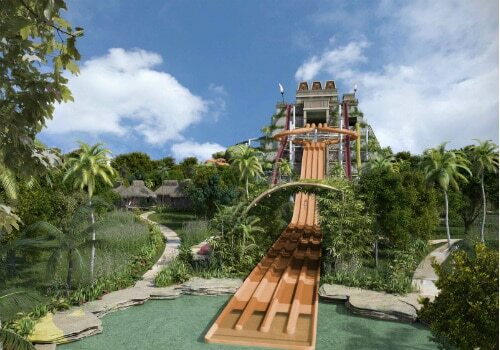 Guests will be able to choose from a variety of water slides as well as a wave pool and a lazy river. And for younger kids, there is plenty of young fun like water playgrounds and smaller slides. So next time you are in Tennessee make sure that you plan enough time for both the theme park and the waterpark. 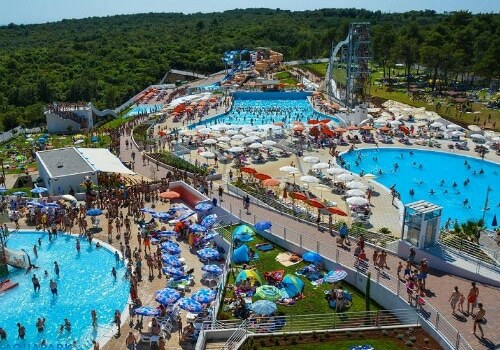 About Waterpark: Located on the Adriatic Sea, Aquapark Istralandia is the perfect destination for a waterpark. Outside of the weather and area, the park features a large selection of waterslides. Slides like Free Fall, Space Rocket, and Sky River highlight the offerings. With so much more than water slides as well, there is no shortage of water activities here either. About Waterpark: Jungle Aqua Park is a vast oasis of water fun that offers 35 water slides and 14 pools (some of them heated). Slides and pools are going to be geared for a wide range of guests as well. So whether you are young or old, adventurous or laid back, there is something for you. Outside of the water, guests will get access to cabanas, relaxation, food, and more. 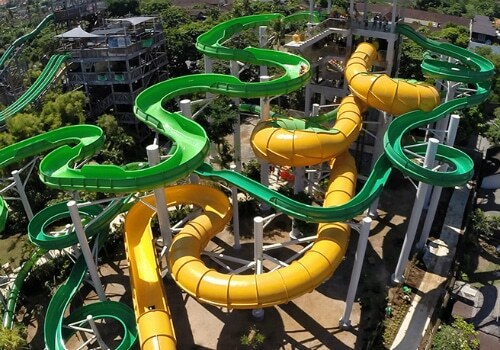 About Waterpark: Rated one of the best waterparks in Asia, Ramayana Water Park offers something for all. From thrilling slides to laid back caves, every guest will have something that appeals to them. Also, with a variety of options for children, Ramayana is the perfect family destination. Ramayana was also built on the ruins of an ancient city as well. So visitors will be able to “explore the remainders of ancient buildings, walls, and sculptures” in between enjoying different water activities. About Waterpark: As part of Holiday World theme park, Splashin’ Sarari is an excellent two for one trip. 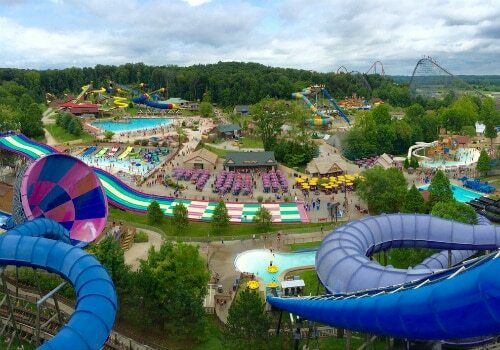 Whether you do Holiday World or not though, Splashin’ Safari is well worth it all on its own. With two of the longest water coasters in the world, Splashin’ Safari is off to a great start. Now add in the rest of the slides, pools, kids areas, and everything else, and you can see why they are one of the best waterparks in the world. About Waterpark: Part of Busch Gardens, Water Country USA is a top waterpark on the East Coast. 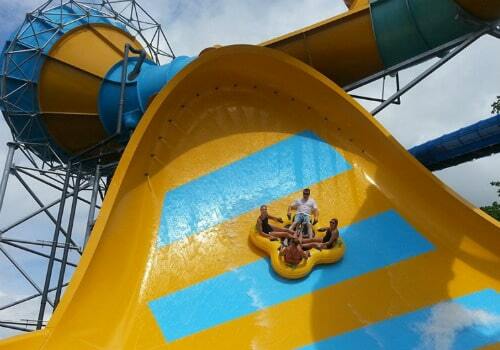 With a variety of slides and rides, everyone in the family will be happy at Water Country USA. Along with the slides and rides, guests will also get access to splash areas, water playgrounds, wave pools, and more. Make sure you plan for at least two days though so that you can visit both Busch Gardens and Water Country USA. 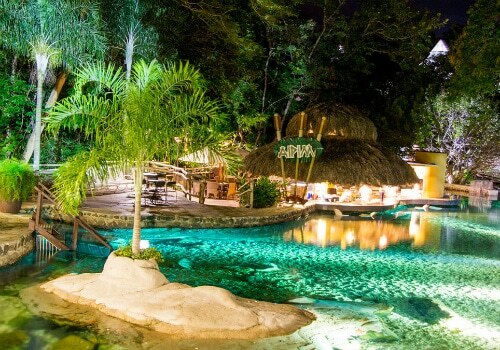 About Waterpark: This water park is going to take you back in time as it is themed with Mayan Culture. Also, all of the slides and rides are based out of a giant Mayan themed temple. This unique take on a waterpark is going to allow for tons of fun. Highlighting the fun are zip lines, splash zones, lazy rivers, and thrilling slides. So for an adventure-filled day at the park, make sure you visit the Lost Mayan Kindom. About Waterpark: Spread out over 70 acres, Noah’s Ark is one of the largest waterparks on this list. With several children’s water play areas, two lazy rivers, and two giant wave pools, Noah’s Ark is a massive waterpark. This is all without even mentioning the world-class water slides offered. These waterslides are highlighted by Raja, Black Anaconda, and Scorpions tail, all of which will get your adrenaline going. So if you are looking for an epic waterpark experience, look no further than the Wisconsin Dells and Noah’s Ark. 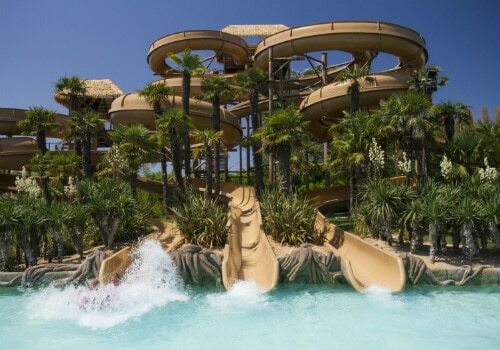 About Waterpark: Italy has a ton of great places to visit, but when it comes to water parks, there is only one place that stands out above the rest; Aqualandia. From thrill-seeking rides to relaxing rivers, they have it all, and for all ages as well. Along with excellent rides, they also offer a variety of entertainment in the park as well. With eight different themed areas to explore as well, Aqualandia is going to provide so much for visitors. About Waterpark: Tropical Islands is a little bit unique in that it resides inside a gigantic airplane hangar. 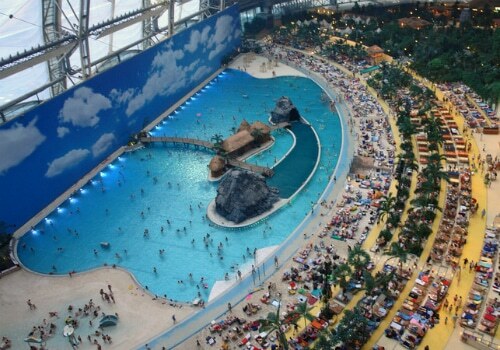 This lush, rainforest inspired indoor oasis is the largest indoor water park in the world. Just a short drive from Berlin, Tropical Islands features everything from balloon rides to free-fall water tower rides. 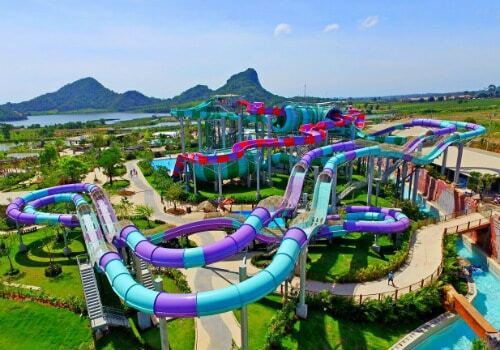 For a unique water park experience, this is one park that should definitely be on your bucket list. 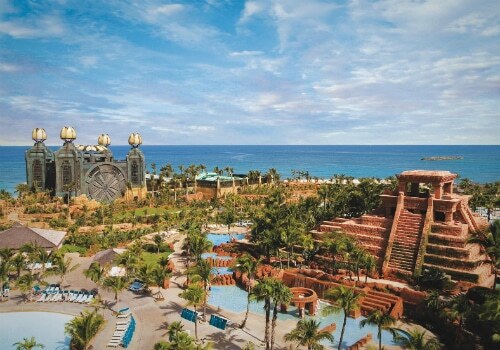 About Waterpark: Part of the Atlantis Resort, Aquaventure is 141 acres of aquatic thrills. Popular attractions include a mile-long river rapids attraction, Master Blaster water coasters, speed slides, and slides that go through a shark-filled lagoon. The park also boasts more than 20 swimming areas and caters to all ages, making this one water park the whole family can enjoy. 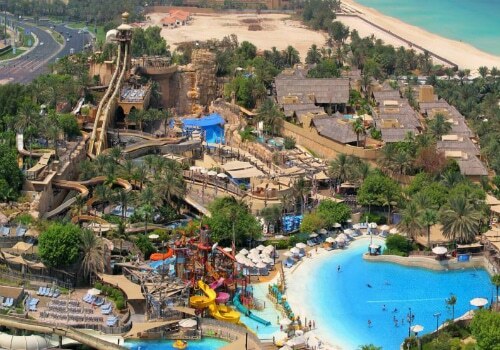 About Waterpark: Yas Waterworld is just a short distance from two other parks on this list (Wild Wadi and Aquaventure, Dubai). 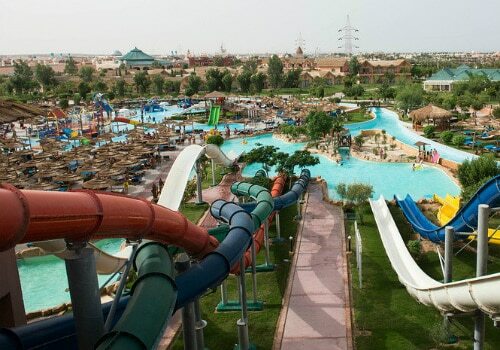 It is an Arabian themed water park that is enjoyed by guests from all over the world. Water coasters, wave machines, and a looping slide are just some of the attractions the park has to offer. This will ensure that visitors always have something to do. About Waterpark: While not as big as some of the other water parks on this list (just under 10 acres), Waterbomb still holds its own. The exquisite setting and well-maintained park make Waterbomb one water park that is truly special. As a bonus, all of the slides and rides also employ salt chlorination, giving your skin a nice break. 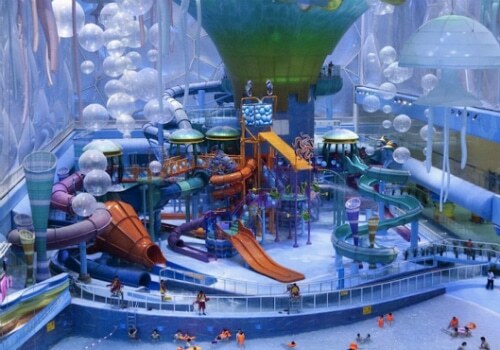 About Waterpark: Beijing’s Watercube Waterpark is the largest water park in Asia. It is housed in the Beijing National Aquatic Center where Olympic athletes once competed. In addition to the 13 water slides, wave pool, lazy river, and thrill rides, the park also houses a spa. So get ready to be pampered after a long day of fun. If you enjoy a good waterpark, then this list has to have you thinking of fun in the sun, or maybe fun in a giant indoor waterpark. 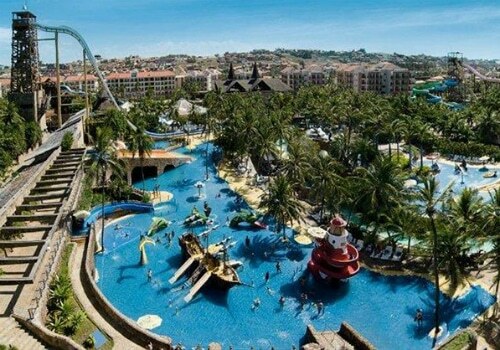 Either way, this list of the best water parks cannot be ignored once seen. So start making plans to enjoy some of the different parks on this list. For all of your travel plans to any of these destinations make sure to visit our list of the best travel sites. This list will help you save money, time, and have you visiting one of these water parks in no time. Have you already visited one of these water parks? If so, we would love to hear your feedback in the comments below.